The post-BSN to DNP with MSN exit with a Nursing Education major requires a total of 70credits. A total of 39 credit hours and 120 teaching practicum and 120 clinical hours must be completed for the MSN exit where the Master of Science in Nursing is conferred. 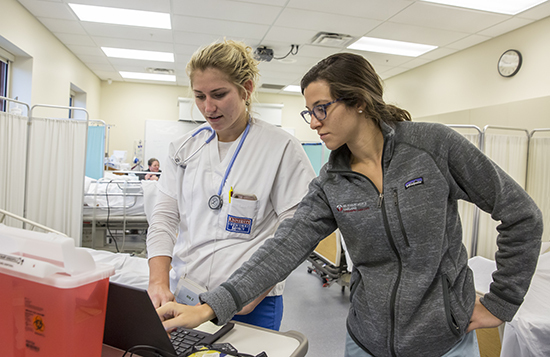 Since the nursing education major does not include an advanced nursing practice major, these students complete an Executive Leadership bridge (6 credits) to bridge to the DNP. An additional 25 credits and additional clinical hours are required for the completion of the DNP. The program is taught in an engaging online format that is flexible and student-centered. Full-time and part-time options are available for degree completion. The certificate program includes learning in the areas of curriculum development and evaluation, course design, teaching/learning methodologies and assessment of student learning, in classroom and clinical settings. Nurses considering teaching in a nursing education program will benefit from studying the art and science of education, which is designed to promote the ability of nurses to facilitate others in learning the art and science of nursing. Credits earned in this certificate program may be applied toward the master’s degree in Nursing Education. Exemplify various teaching/learning strategies and approaches appropriate for classroom, laboratory and clinical settings. Integrate facilitation of learner development and formation as nurses into personal growth as an educator. Explain the processes of curricular design and evaluation of program outcomes. Design and implement curriculum development and evaluation projects. Develop a set of resources and a plan for ongoing self-development as an educator. Differentiate the teaching, scholarship and service roles of the educator.